Fellow Archons, Heamonculi and other commorites! The Kabal of The Deadly Mist brings a tale of conquest to your banquet. Like a fog, all is enveloped, confusion reigns and death is in the air. The Kabal is participating in a Local League of 5 games. Maelstrom Missions are the Primary Objective in all of the games with secondary missions that vary and the three bonus points. One game per week. The lists are 1750 pts and I will be writing about the exploits of the Dark Kin on this thread. So, make sure you read, follow or what not. The first game. Was against Decurion Necrons, with a destroyer cult and a mephrit dynasty c'tan formation. Space Reserved for the list and what not. 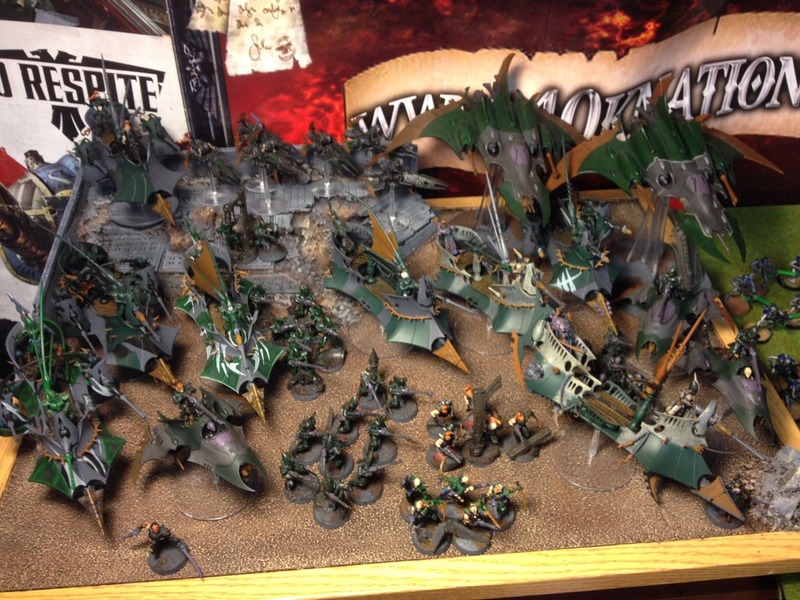 Here is a teaser pic of the Dark Eldar army that I am running ( allying with same faction is allowed in this league). So this is the 1750 pt list. Lots of lance, lots of poison, haywire is ok... And many many units. Anti horde with the missiles as well. It's designed to msu and kill with mass focuss of firepower. 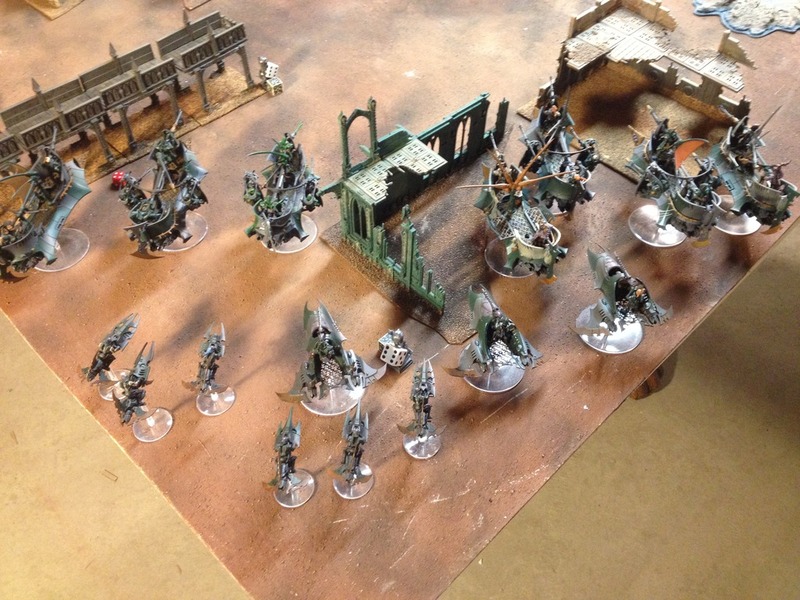 So I added the dark eldar list to the second post. 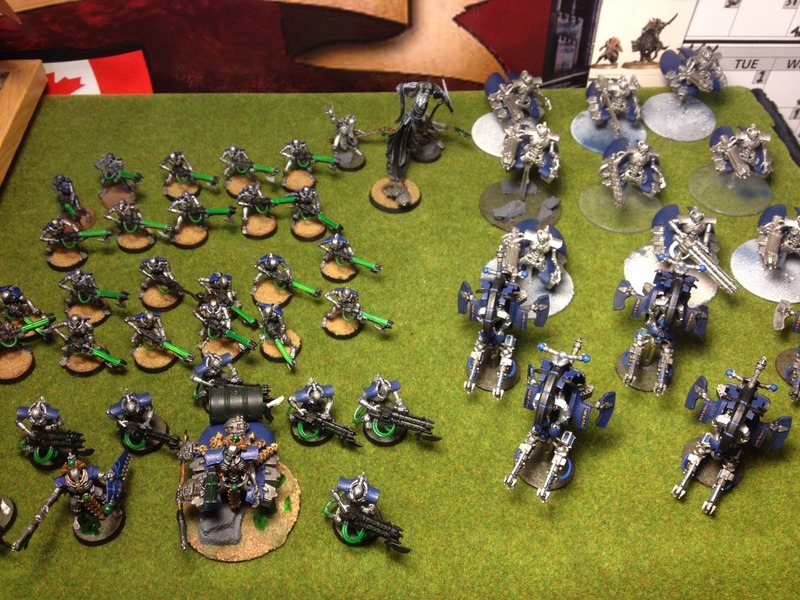 The first game was against a decurion necron army... And it was to be a rough learning lesson! But I did learn. 3 units of 3 destroyers with a heavy gauss cannon in each. Ctan Shackle Thing from the Mephrit Dynasty. Cryptec with a veil of darkness and +1str and +1t to the ctan wargear. Cryptec with a 2+ re rollable save, and a str 6 staff of light. So... very tough list. The mission was Maelstrom primary, the last mission, start with 6 cards and get one less every turn. Secondary was a tablequarter one, you got to score tablequarters by number of units within the quarters... scoring started turn 2 and was every player turn, with your own quarter being worth 0, each neutral was worth 1 and the enemy quarter was 2... obsec units counted as 2 for this scoring (except tanks). Writing it as I can take the time too. Yeah, two small units of wyches! Hehe. 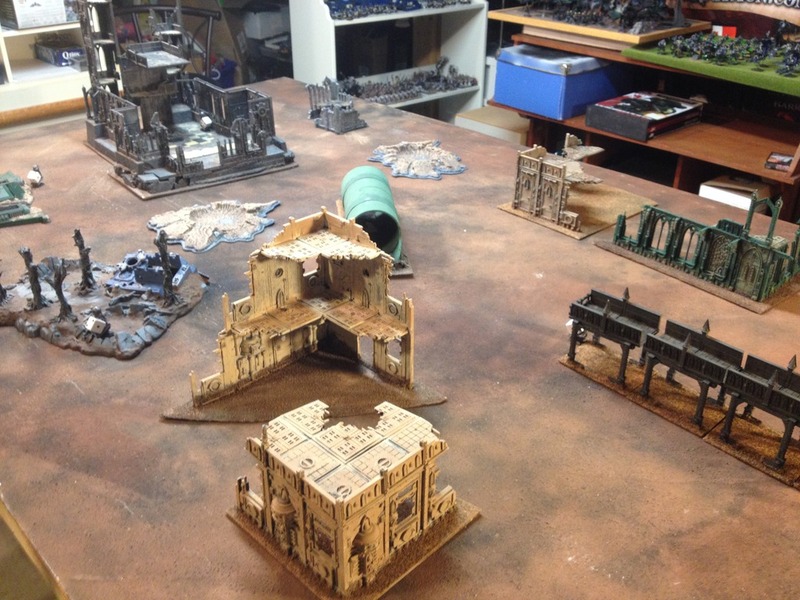 The table was set, the objectives placed. And deployment... the Necrons took the first turn. 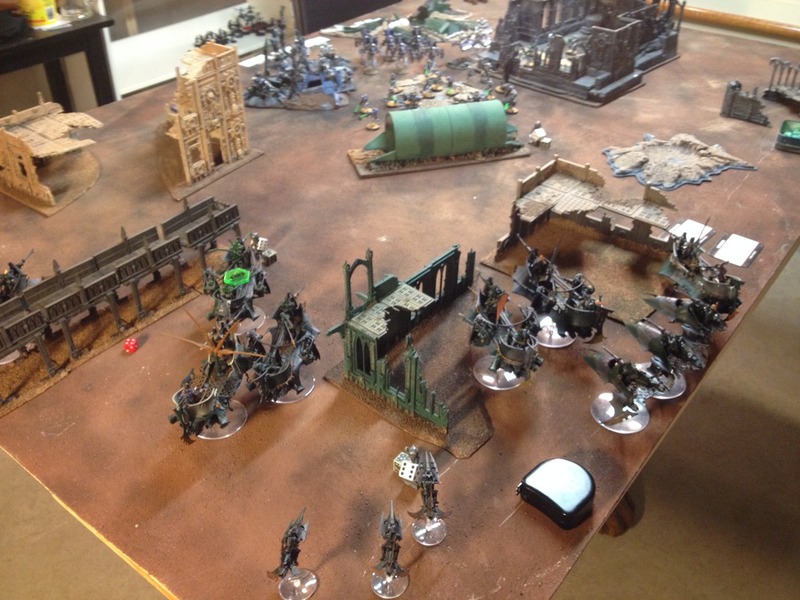 I had deployed, and kept most, if not all of my tanks outside of the main ranges for the enemy army, so the Necron turn one, saw me jink a few tanks, and escape relatively unscathed, the nightbringer formation veiled to my left flank tablequarter and the necron jetbikes moved centrally to be important later in the game, their ignore cover weapons are amazing. My deployment was cramming a lot of things in my deployment zone. And in my first turn I focused as much as I could on one unit of destroyers! And i had forgotten that they have two wounds now... so my calculations were off, and I only killed two. The game continued with me shooting alot and not killing much, and slowly loosing mins. But the game was maelstrom! I had a lot of obsec... and he had none. So... the game was him getting points, and me sacrificing units to gain objective points, only to be killed in turn... the RP of a 4+ with re rolls of one was proving to be super tough indeed. I finally killed a unit of destroyers, but I was really unable to do any lasting damage... I almost killed the c'tan... but was unable to. And at the end of the game I had about 5 miniatures left! And my opponent had only lost a few things here and there... but with the mobility and obsec I had pulled out a primary victory! (he had secondary) and with the splitting of the tertiary points it was a down the middle draw! And the league had started with a very fun and intense battle. Have to focus fire better against the crons. The movement was awesme and I did miss my grotesquerie... they are a tough cookie and solve a lot of problems for the Dark Eldar. Thanks for the mini bat rep Skari. Your list looks quite potent! This is typical of my exp vs newcrons. You will be hard pressed to inflict any significant damage to them so play the mission. It's actually good training for me as its easy to get side-tracked ripping up my enemy. Anyway when I play against the crons I try to stay out of range of most things (which you did) and torrent down the destroyers (which you did). I love caltrop reavers (I take at least 12 of them) and I use them to tie up the tomb blades in assault and charge/hit and run/charge them till all dead. A grotesquerie strait to his gunline can really mess them up. Looking forward to more batreps! Thanx. BTW love the tactical corner at the end of your videos! I learn so much from these. Man, what is the toughness of the destroyers? I must say that is impressive who you managed to.make.something almost bad into something not as bad. I am supporting the change of acronyms of reanimation protocols from "RP" to "RAP" (ReAnimation). Aaanyway. Really liked the paint scheme on those necrons, and looks like you had a fun game as well. Nice write up, Skari. Thanks for doing it. I agree that the Grotesquerie would've served you well. I've only played two games against the new Necrons and both times I found that my MVPs were Grotesques and Dark Artisan, as they can reliably whittle down the Necrons in CC. As you experienced, trying to win a war of attrition against Necrons by shooting them is a borderline futile effort. The only way I've seen to reliably take them out en masse is to sweep them in CC which is where Freakish Spectacle + AoM comes in quite handy. @ Painjunky: Thanks for the comment, I do like the tactical corner stuff, it really helps. The jetbikes in this game got smoked by the c'tan that rolled the ignore cover large blast shot... boo! Lol. @ JackKnife 01: They are T5... and 2 wounds. Tough. @mngwa : Yes it was a fun a tough game. Fred and I always have some close in our games. @sweetbacon: No problem! I thought some written stuff might be cool. It also helped that my camera flubbed out half way through the game so no video batrep! Will be getting my round two opponent soon! For week two of the league. 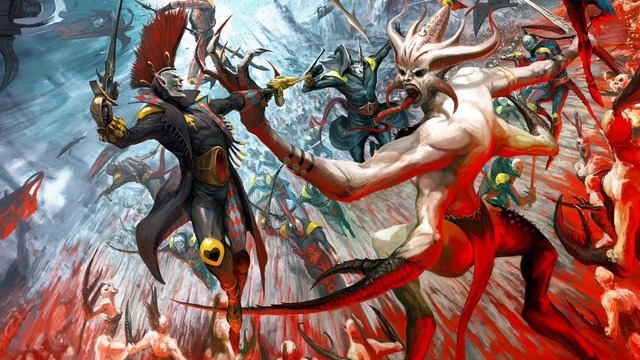 Im comming off getting tabled by my brother during a friendly game, so the Dark eldar will be looking for vengeance! Wait... Skari got tabled!?! That just completely ruins my perception of good and evil in this world!! Would like to hear the details of how this unnatural, blasphemous event ever occurred one day!! The tabling? Lol. Got siezed on. 4 lascannon shots at four different tanks, failed all the jinks... Every tank exploded. And then turn two my on foot grotesques Got obliterated by a bang on orbital bombardment. Was all down hill from there. Lol all caught on tape! So expect a batrep for it soon. Game for week 2 has been set! I get to play against Matt (a regular on the channel with his amazing alpha legion army) this time he busts out his NEW Brass Scorpion! A nastly stompin lord of war with ignore cover weapons and all... this will be fun. So this game has come and gone. Oh my. I got spanked. 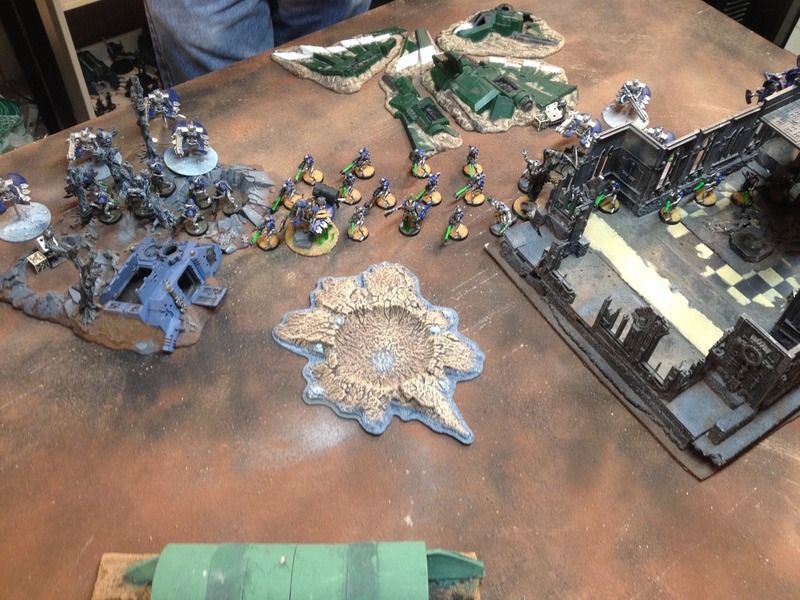 The brass scorp did most of the damage with its str 10 ignore cover blast blowing up ravagers and raiders every turn. Turn one and two, with all my dark lances put two hullpoints on it and one regenerated with it will not die. It was quite te learning experience for my dark eldar and I will have a report up with pics soon. Needless to say! ... Must have a rematch. How tough is that scorpion thing? Good luck next time! Look forward to some pictures. That scorpion thing is pretty good! Not OP tho. It just made alot of invul saves. So Skari, don't feel to bad about the Brass Scorpion. I just watched one of them destroy three Ork Stompas....by itself. Kind of crazy to watch really. The Brass Scorpion game will be up on youtube tonight or tmr afternoon! So stay tuned for that, ill post it here as well I guess. SO! On to game three... a horde necron decurion. The Mission - Maelstrom Escalating Engagement! 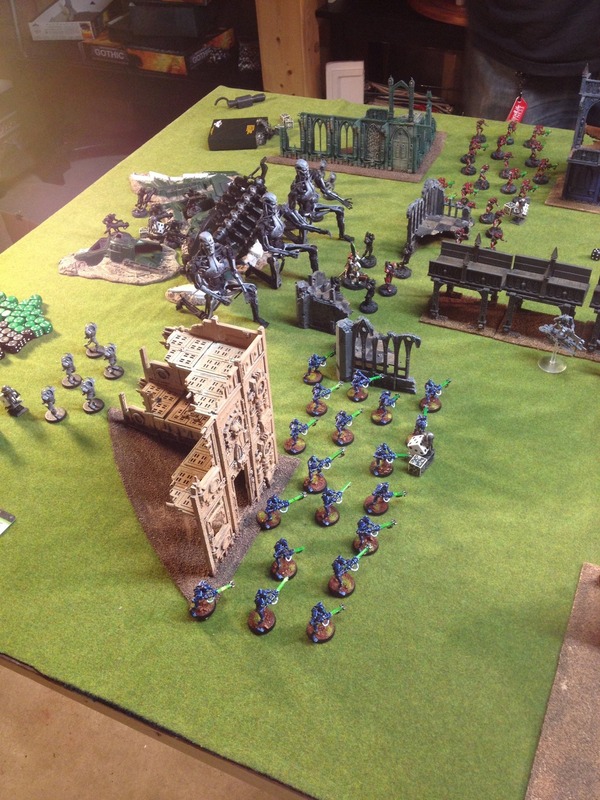 - just off the batt, this mission is hard for an army like dark eldar to play against a very resilient foe, like the decurion especially. Low points at the start and then higher at the end with the war of attrition taking its toll, so an army like a horde decurion really excells at this... I knew it was going to be a tough one. Deployment - Hammer and anvil - I did have the advantage with this style... being able to stay out of range of his guns and hit where I want to when I want to.